​ I have seen many movies in my lifetime, but I can honestly say that I was not ready for this! Without spoiling the plot for moviegoers, I will just say that I was too numb to cry and too angry to scream. As an African American mother with a son, it is very disturbing to realize something like this has actually happened. It is very important for everyone to see this movie. It is important to have a conversation about the content of this movie with the men in your life. “There is nothing new under the sun”. That quote can be a good or a bad thing. Unfortunately, in this case, that is a bad thing. The fact that there is a president in office that told police not to be nice to suspects is a definite indication that not much has changed. He basically gave law enforcement the permission to practice police brutality. Just the mere face that idiots actually voted this nut job in office makes me realize that racism is alive and running rampant. This move highlights events that happened 50 years ago, but are extremely parallel to events that are happening now. The Darren Wilson’s and George Zimmerman’s of the world hide behind uniforms and title’s that are supposed to represent law enforcement. What they really indicate is that they are cowards that prey on African American’s solely based on the color of their skin. “Knowledge is power”. This unwarranted bias against African Americans is not new. This injustice stems from ignorance passed down through generations of hatred with no justification. This movie is heart wrenching at the least. It’s a moment in history that we all should be mindful of. 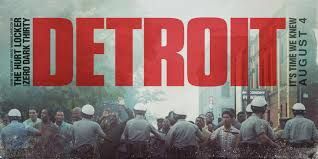 From the riots in Ferguson, Missouri to the riots in Baltimore, MD., I realize that we are not too far from the injustice that happened in “Detroit” 50 years ago. All I have to say is we owe it to ourselves to see this movie. Brace yourself!